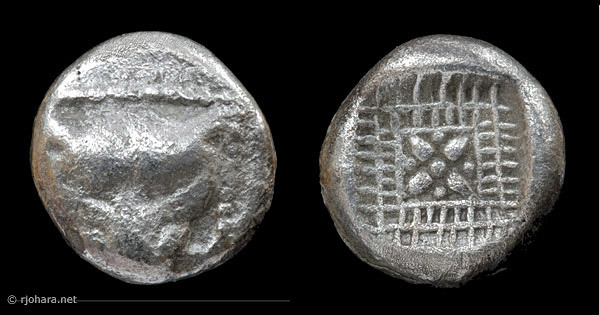 These interesting silver fractions echo the reverse designs of the familiar archaic twelfth staters of Miletus, and (assuming they are earlier) hint at how those designs might have developed. The principal curiosity of this series, however, is its unusual metrology: published sources describe the known denominations as eighth staters, sixteenth staters, thirty-second staters, and sixty-fourth staters. Nearly all coins issued under the Lydo-Milesian standard, however, follow a different system of division: into thirds, sixths, twelfths, and so on. 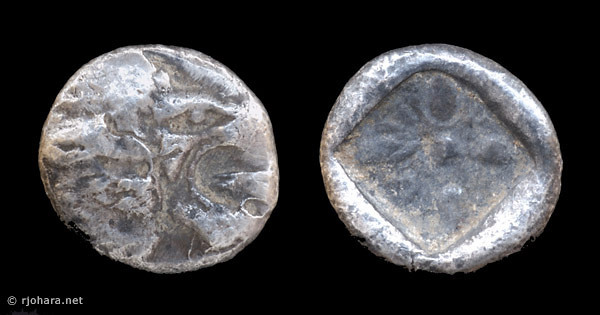 Konuk (2002) describes six specimens in this series from the Kayhan collection as eighth staters, with weights that range from 1.54–1.67 g. Assuming a Lydo-Milesian standard stater of 14.1 g, an eighth stater ought to weigh 1.76 g, so all the Kayhan specimens would seem to be a bit underweight. Konuk also describes a thirty-second stater very similar to RJO 58 (below), with a weight of 0.37 g. A Lydo-Milesian thirty-second stater would be expected to have a weight of 0.44 g. The accompanying table summarizes the weights of published specimens from this series, as well as the specimens included in this collection. Table 1. Examples of the dotted lion-mask series. These data suggest that the weight standard being followed here is slightly reduced (or is just different) from the typical Lydo-Milesian standard. Could these coins represent a transitional issue from the period when electrum was being replaced by silver and weight standards were in flux? There is a very interesting history here waiting to be discovered. Adding to the interest of this series is a single and possibly important specimen below (RJO 66, 0.38 g) which appears to be a thirty-second stater under this reduced weight standard, and yet features the full design of the common twelfth staters, with a lion’s head to right on the obverse—rather than the dotted lion mask facing—and an incuse sun/star on the reverse. I can find no published examples of this type in this apparent denomination. Could it be a rare prototype for the later twelfth staters? Parallel issues from Ephesus: There is a parallel series of silver coins from Ephesus that seem to follow this same denominational system, and that often have a Milesian-style sun or star on the reverse—an apparently early feature which was later replaced invariantly with the image of a stag. Within this series the circular dotted border around the obverse bee—familiar from later Ephesian silver—also makes its first appearance. Published examples of this Ephesian series include Kayhan #113–138 (Konuk, 2002). Comparative study of the Ephesian and Milesian series might yield interesting results. The obverse design in this series is relatively consistent across denominations (with the dotted border around the lion mask being more or less visible depending upon the shape of the flan), but the reverse design varies considerably, from a square lattice (RJO 74), to a square pattern of dots (RJO 59), to a design very similar to the ornamental sun design of the common Milesian twelfth staters (RJO 60). 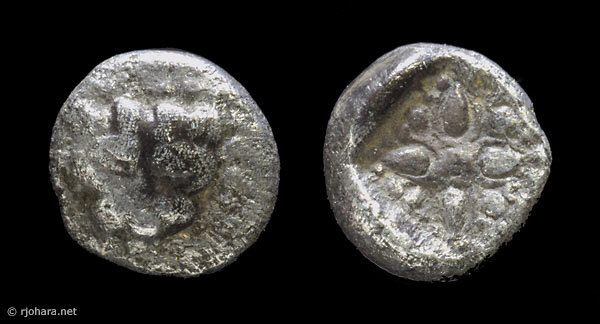 As noted above, specimens of this denomination are usually said to be Lydo-Milesian eighth staters with a standard weight of 1.76 g, but the data seem to point to a standard closer to 1.6 g.
RJO 74. Silver 1/8 stater? 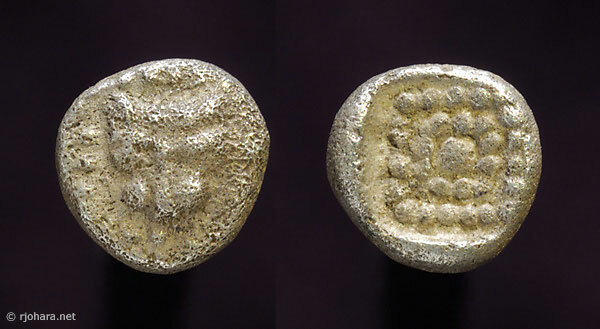 (1.58 g), about 550–500 BC. Obverse: facing lion mask within dotted border. Reverse: square lattice-like incuse with four-part ornament in center. As noted above, specimens of this denomination are usually said to be Lydo-Milesian sixteenth staters with a standard weight of 0.88 g, but the data seem to point to a standard closer to 0.8 g.
As noted above, specimens of this denomination are usually said to be Lydo-Milesian thirty-second staters with a standard weight of 0.44 g, but the data seem to point to a standard weight closer to 0.40 g.
RJO 58. Silver 1/32 stater? (0.32 g), about 550–500 BC. Obverse: facing lion mask within dotted border. Reverse: incuse sun ornament similar to Milesian twelfth staters but within dotted border. RJO 90. Silver 1/32 stater? (0.34 g), about 550–500 BC. Obverse: facing lion mask within dotted border, partly off the flan. Reverse: incuse sun ornament similar to Milesian twelfth staters but within dotted border. As noted above, specimens of this denomination are usually said to be Lydo-Milesian sixty-fourth staters with a standard weight of 0.22 g, but the data seem to point to a standard weight closer to 0.20 g. These specimens demonstrate also that variation in the reverse design occurs within denominations as well as between denominations. RJO 59. Silver 1/64 stater? (0.20 g), about 550–500 BC. Obverse: facing lion mask within dotted border. Reverse: central dot surrounded by two dotted squares. RJO 60. Silver 1/64 stater? (0.18 g), about 550–500 BC. Obverse: facing lion mask within dotted border. Reverse: incuse sun ornament similar to Milesian twelfth staters. The dotted lion-mask series described above appears to belong to a group of contemporaneous Ionian issues that have an unusual metrology and (in many cases) a common reverse sun/star design. This group includes the series from Ephesus noted above (Konuk, 2002: #113–138), as well as the single and possibly unique Milesian specimen below. Could could this specimen be a rare prototype for the later twelfth staters? 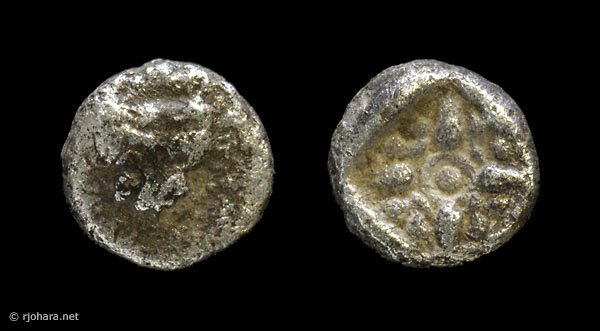 (3a) AR Lydo-Milesian 1/32 Stater? (0.44 g) · Unique Denomination? 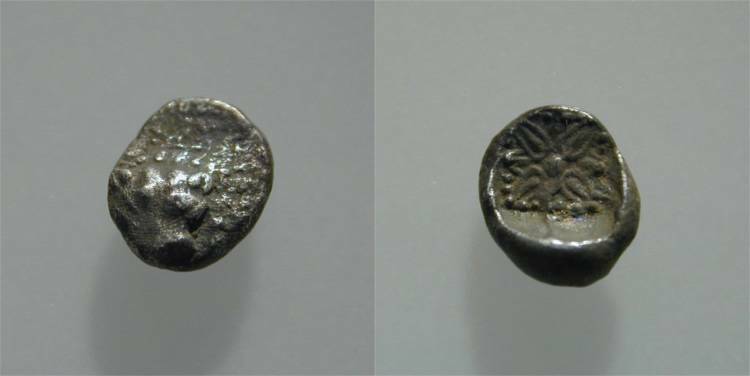 Although this lion/sun type is common in twelfth-stater denominations, I can find no published examples of apparent thirty-second staters. RJO 66. Silver 1/32 stater? (0.38 g), about 550–500 BC. Obverse: lion’s head right. Reverse: incuse sun ornament similar to Milesian twelfth staters.